Get 1% cash back on contactless payment transactions and pre-autorized payments to service providers, and 0.5% on all your other purchases. Your account is automatically credited when you accumulate $25 cash back. 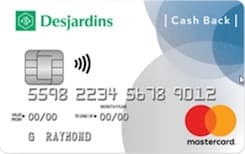 This CAD currency 30 is issued by Desjardins and runs on the MasterCard Network. The purchase interest rate for this credit card is: 19.9 percent annually and the transfer balance interest rate is: 19.99% per year. Also the cash advance rate is: 19.99% per year. Travel cancelation is Included for this credit card and also travel accidents are Included.